Some dogs dig, bark and trample, but there are ways to turn your yard into a dog-friendly zone rather than your pet peeve. For all the time we spend in our yards barbecuing, planting, pruning, raking and mowing, our dogs are outside twice as much, if not more. “They go out when it rains, snows, shines, at 2 in the morning,” Bublitz says. And because dogs are instinctual and habitual, they often undo our hard work, turning lush grass and flower gardens into trampled trails from routine patrolling and games of bark-and-seek along the fence—not to mention freshly dug holes. But don’t lose hope, says Bublitz, who founded Golden-based Pawfriendly Landscapes in 1998 to help homeowners turn their yards into havens for themselves and their pets. Sometimes it’s just a matter of working with a dog’s nature to find middle ground, she says. Jezibella loves to swim and retrieve, so James added a water feature and a ball-playing lawn area for her. Jasper doesn’t like to swim, so James installed a platform in the pond for him to stand on to cool his paws on hot days. “He’s a barker and a digger,” says James, who made a see-through fence for Jasper and installed boulders for him to sit on to survey the adjoining open space. She also made him his own digging area. By taking her dogs’ traits into account, James created a fulfilling landscape that both she and her pets enjoy. “I would rather have a dog-friendly yard than a really gorgeous, masterpiece backyard you wouldn’t want dogs running in,” she says. If you agree, here are 10 dog-friendly ideas to consider for your yard. But never leave a dog outside alone all day. According to The Humane Society of the United States, dogs need and crave companionship, and should spend most of their time with their family, not alone outside. On hot, sunny days you’ll notice your dog smartly follows the shade. To make sure she’s never without a cool-down place, plant shade-bearing trees and bushes. Patio covers, pergolas, vine-covered trellises, and sail shades make for cool lounging. In hardscapes, umbrellas with built-in holders create interchangeable sun/shade zones. Dogs love overlooks, to keep track of everything going on in their kingdom. While an elevated deck works great as a survey point, features like berms and a string of various-sized boulders to perch on work well as doggy destinations throughout the yard. The advantage to gravel is it keeps mud off paws in the winter. “All my flower beds have rock on them so the dogs don’t track mud in the house,” James says. 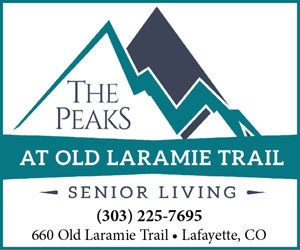 With a landscape of rock, ground covers and grass, “only water gets inside from snow, and that’s a lot easier to deal with than mud.” James also installed looping paths on her dogs’ most-loved routes for them to run on. You’ve probably noticed your pooch has a few favorite backyard spots for basking. Make these sunbathing places even more comfy by planting soft grass and adding doggy daybeds made of weatherproof fabric. Certain plants hold up better than others under constant treading, says James, who planted junipers, creeping blue spruce, mugo pine, honey locust, lilacs, alyssum and lavender in her dog-friendly yard. 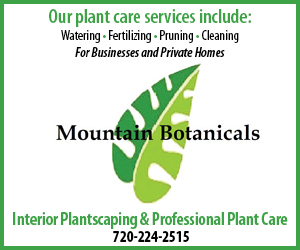 For color, she introduces potted annuals and perennials in the growing season. Ground covers that don’t mind a good trampling include thymes (but not Spanish thyme, which is toxic to dogs) and ice plants. In shady areas, she planted mosses. “I have a woolly thyme, a gray thyme and a creeping thyme,” James says. “They’re low-water, they grow fast and fill in, and they take abuse.” But you don’t want your dog running roughshod over everything. James planted barriers, including thick juniper hedges and low-growing creeping roses, to protect flower beds. Whether for fun, to cool off, or to pursue a burrowing critter, some dogs love to dig. 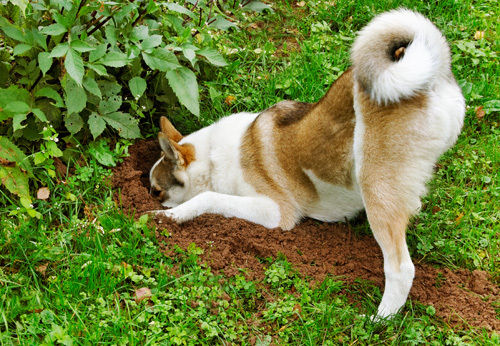 To minimize damage, create special dig pits for your dog in areas where he has a good overall view of the yard. Shovel out a decent-sized patch of earth to a depth of 18 inches and backfill it with playground sand. James filled Jasper’s digging spot with a combination of potting soil, vermiculite, peat and sand. “I tried to make it soft so he’d like it,” she says. Encourage your digger to use his spot by burying his favorite toys or treats in the pit. Position the pit in partial shade, so your dog has the choice of lying in the sun or shade. On hot days, you may find your pooch belly-down in the cool sand. If you like, place paw-friendly borders around the pit that match your garden’s motif. If your pooch is a flowerpot digger, put a couple of pots in the pit just for him. Praise him when he digs in those pots; lightly reprimand him when he digs in yours. Privacy fences are great for screening out passersby, but they’re also a point of frustration for dogs curious about the smells and sounds drifting in from beyond the Great Wall. The solution is to cut windows into your fence about 18 inches from the ground (or to your dog’s height) and cover them securely with chicken wire. The windows will satisfy your dog’s curiosity, and may even minimize barking since your dog can now see what’s going on outside the fence. Pet stores also sell plastic bubble-like “pet peeks” that easily install into a fence. To give your pet refuge from wind, rain and snow, put a doghouse in the yard where it will be protected from heat and cold. Face the doorway away from prevailing wind and snow, and cover the doorway with vinyl or carpet strips to keep out sun and the elements. Building a doghouse can be a fun project for parents and kids, but the house should only be large enough for the dog to easily turn around and lie down completely stretched out. Bigger isn’t better; dogs feel more secure in small spaces. Pet stores also offer a variety of manufactured doghouses. Don’t be afraid to plant for your dog. Mint and fleabane are natural flea repellents. Marigold and lemon thyme deter ticks. But always check the ASPCA website (www.aspca.org/pet-care/poison-control/plants) for toxic dog and cat plants before planting anything. Putting aromatic vegetation like lavender, rosemary and salvia in places where your pet likes to explore will ensure that he or she comes back smelling sweet and lovely and ready for hugs!